Kyuro Sasaki is a professor of Department of Earth Resources Engineering, Faculty of Engineering, Kyushu University, Japan (KU) since 2005. He had taught at Mining College, Akita University for 20 years, and moved to KU. He holds BS, MS and PhD degrees from Hokkaido University, Sapporo, Japan. His research interests are fluid mechanics and heat & mass transfer phenomena in mineral resource production processes, and published several papers on SAGD, Methane Hydrate Production Method and Enhanced Coal Bed Methane Recovery, CO2 Geological Storage, Spontaneous Combustion of Coal and Mine Ventilation. He recently has studied CO2 behaviors in reservoir conditions by PVT measurements and numerical simulations. Winner: Yuichi Sugai, Kyuro Sasaki, Toshiya Niimi, et al. This paper investigates the preliminary strategies and tools for the implementation of CO2 air capture and geological storage as a potential mitigation option in the future climate policy of Iran. Heavy oil production depends on reservoir characteristics like permeability, reservoir pressure and oil viscosity. A gas production system from methane hydrate (MH) sediment layers by combination method with hot water injection and bottom hole pressure control at production well using radial horizontal wells has been proposed. As a web essay in JSPS "KAKENHI ESSAY SERIES", I introduce my mention on the KAKENHI and necessity of research on "Mineral Energy Resources and Reduction of CO2 Emission" for young researchers. 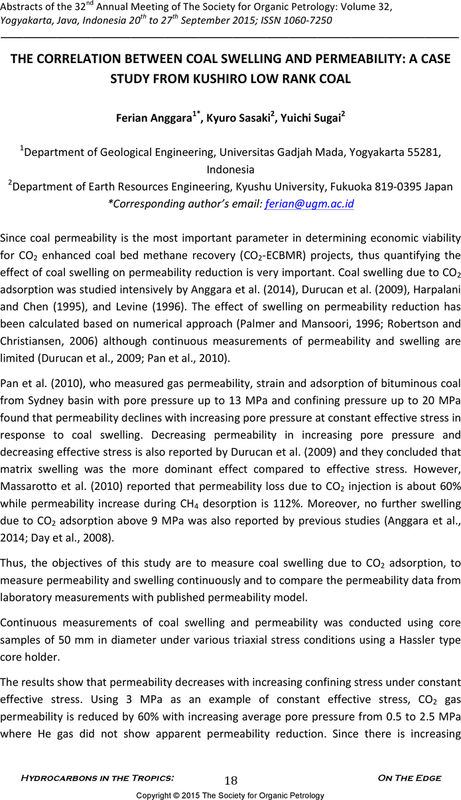 laboratory measurements with published permeability model. A integrated gas production system from methane hydrate layer by circulating hot water using a pair of dualhorizontal wells has been proposed. The JSPS project "Formation of the Asian Center for Research on Earth Resources and Environment for International Research Associates and Graduate Students -JSPS International Training Program at Kyushu Universityー" was introduced. The new concept for final pit shape in open pit design namely Best Positive Inverted Truncated Cone (BPITC) algorithm is presented for feasibility study and scheduling. 12th U.S./North American Mine Ventilation Symposium (Reno, USA) 10 Jun 2008 Underground Ventilation Committee of the Society of Mining, Metallurgy, and Exploration, Inc.